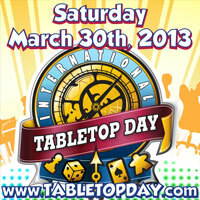 Welcome to the ticket sales page for Table Top Day on Top of the World, a 21+ event celebrating premium YouTube channel Geek & Sundry's event International Table Top Day on March 30, 2013. From 11:00 AM to 5:00 PM, we will have the run of the entire 76th floor (that's the top!) and much of the 75th floor of the Columbia Tower. There will be games, games and more games! We'll also have live streaming of the main Table Top Day event in Los Angeles, where you can watch Felicia Day and Wil Wheaton play games. Our event is now sold out! If you would like to add yourself to the waitlist, click here. For more information on our event, see our Website at http://www.DawgsledEvents.com.